My field assignment at East Los Angeles College ended three weeks ago, so now I have to travel to the Eastside purposefully to eat tacos, which I will gladly do. And pobrecita Carmen has been to so few of these Eastside taquerías with me. We trekked out to Boyle Heights for dinner at conspicuous Carnitas Michoacan #3 on Whittier Boulevard, an eye-attractor for many reasons – it has both a giant hamburger and a giant dinosaur on the roof; it has “carnitas” in the name of the restaurant; car-lot-style flapping flags overhead; and the sign out front claims boldly of their tacos “OVER 5 ZILLION SOLD”. This latter fact is quite dubious, although the quantity in a zillion cannot be verified by press time. By making such a claim Michoacan #3 is throwing down the gauntlet at their competitors down the street – you’ve got to be pretty confident to take on McDonald’s. 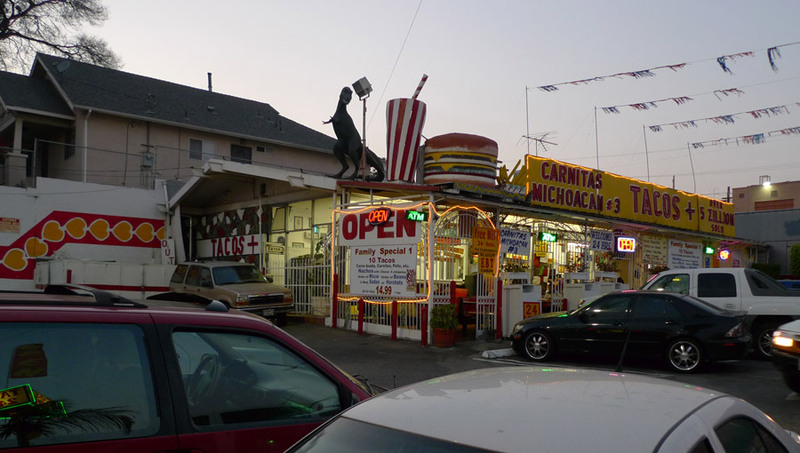 Michoacan #3 has the look and feel of a neighborhood institution and hangout. Open 24 hours, it has a dining area featuring arcade games, jukebox, and a candy-filled vending machine. Best of all, it’s a perfect indoor/outdoor space, under a roof but separated from the parking lot only by fence. Putting on one’s deerstalker cap and pondering while waiting for them to call order #9, one imagines that a taco stand came first; the canopy out front added later; and the fencing still later, resulting organically in the pleasing space that exists today. You would have to be pretty cynical not to be charmed by the informal collection of ad hoc signs and graphics on display here. Carmen took her cue from the name of the restaurant and ordered three carnitas tacos, while I hedged my bets characteristically, ordering one each of the carnitas, carne asada, and al pastor tacos. These were $1.25 each and a little above average in size. I felt obliged to eat them in a predetermined order, because the three tacos slightly overlapped on my plate like a Venn diagram, and it seemed correct to eat whichever taco that was on top. Tortillas were the normal kind, bilaminated. The al pastor was delicious, carved off a revolving spit, and with nicely contrasting orange bits and blackened grilly bits. The meat exhibits both some sauciness and some dryrubbiness somehow, and overall sweet, fragrant, and tasting of many spices; it did not emphasize the savory chile/garlicky/oniony aspect that often comes across so strongly in non-spitted al pastor varieties. The house red salsa is really good and pretty hot, and complimented the al pastor well. Next up was the house specialty, a fine and platonic carnitas with nicely variable texture and a strong smoky, porky flavor. In tandem with the red salsa this made for a truly righteous taco – these tacos really get to the essence of what Taco-ness is all about. 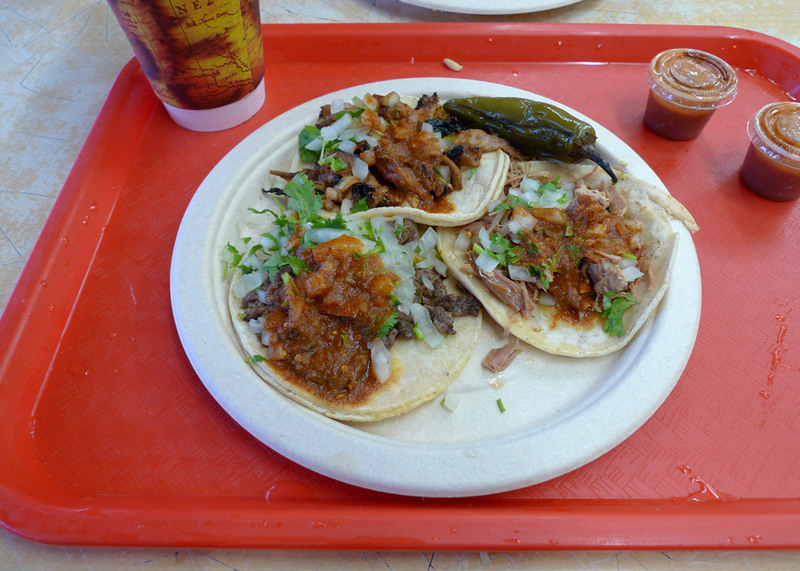 The same must be said of the carne asada, which was moist, flavorful, very beefy – really good. I would like to become a frequenter of the Michoacan #3.